Arc The Lad: Set 2 continues the intriguing and strange story of Elk, Shu, and Lieza, as they avoid mysterious forces attempting to capture them. In the first volume, Elk and his companions decided to lay low for awhile in town. Unfortunately, someone decided to post a monster bounty on Pandit, Lieza's pet wolf, which drew attention to them. Elk and Shu set off to investigate. As Set #2 begins, Elk discovers that the bounty on Pandit has been cancelled, losing him his only lead on who is pursuing them. He and his companions decide to attend the dedication of a new statue, the statue of the Goddess of Peace. Upon arriving, Lieza is harassed by the same men in black coats that harassed them before. Obviously members of the secret, mutant organization White House, they attack by transforming in to Chimera beasts. The battle is interrupted, however, and the peace proceeding comes under attack from the sky. Indeed, the attack is started by the mysterious, anti-government rebel Arc, in his giant airship. As Elk, Shu, and Lieza make their escape, they make the rather disturbing discovery that the mayor, Galuano, is actually incredibly corrupt and cowardly. Arc and his crew attempt to kill Galuano, for some perceived injustice, but he escapes. Elk, however, won't lose his chance for revenge on Arc, whom he blames for killing his family, so he pursues the airship as far as possible. In the process, though, Elk crashes his airship on a small island, with a very sparse population. His quest is far from an end, however. As you may already be able to tell, these three episodes are a bit more action-filled than the first volume. Even so, the more detailed story elements still come through, and more flashbacks are used to explain some of the more mysterious aspects of the plot. If the first disc didn't grab you, this one should. While watching the first set, I was not only entertained, but I felt like Arc could be something special. Now, having digested the second disc, I know this is something special. I've seen a lot of anime series, some of which I've reviewed here. Out of all those I've encountered (not including movies), I would have to say I was most impressed with Outlaw Star, at least until now. Arc The Lad is certainly in a close second, and creeping up. I find it a remarkably well told, beautiful story that is loaded with class and presentation. It's ironic that is is based on a series of video role-playing games, because anyone who's actually spent some time with RPGs will almost feel like they're watching one unfold here. I especially like how the emotional portions are so well done, without going as overboard as some anime does. The humor is also well placed, and doesn't negate the serious touch that's being used. From the haunting orchestral score to the gorgeous animation, Arc The Lad is among the best in Japanese animation. It finely mixes action and philosophical drama in a very epic way, to tell a very immersive story about a group of people who don't know where they have come from or where they're going. I think I can safely recommend this to just about any fan of fantasy/adventure material. It's just too bad we have to go from disc to disc like this. Image Transfer Review: There are really no complaints, image-wise. Another spectacular, crystal clear transfer from ADV, brings out the fine detail of the animation, as if each cel was painted onto your screen. At times this makes minor flaws stick out (obvious brushstrokes, etc. ), but in the case of animation, the more detail, the better. Audio Transfer Review: The audio is somewhat more muted and calmer than I remember the previous volume being. There is virtually no surround usage, and the general ambience is a bit weaker. This isn't entirely bad, though, as the rest of the soundtrack makes up for it with good rendering of the music and sound effects, with hefty, thick sound where it's required. The English dub is passable, but nothing special. The dialogue remains similar to the Japanese, without any major changes. Extras Review: There are no real features, except some trailers and a promo reel for ADV's DVD material. The design is virtually identical to the first volume, with only very minor changes to cover and menu design. 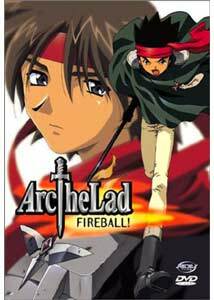 Arc The Lad has impressed me quite a bit, but the 3-episode format just isn't working. I'd really like to see 6 per disc, at minimum. The story paced to slow to really be split up like this. It feels like taking a chapter from a book and splitting it into further chapters. I also understand this is a very long series, so we're also talking about some significant cost as well, to collectors. Regardless, find it and watch it; it's top notch anime. Sometime soon, hopefully, we'll eventually see the video games released as well, which will be exciting. Working Designs expects a late 2001 release. Check out their website at Working Designs.Com, and look directly at info on the collection here.